I liked the idea of a prepaid account because I just wanted to buy the device and the “pay as you go” model fit my usage. Of course you can’t predict the future, and those Virgin Mobile folks have changed the pricing more than once. When I was planning to buy one, the 3 options were $10, $20, and $40, and by the time I bought one weeks later, it was $20, $40, and $50. And who know? They may change again…. Urgh. I’m not sure that Virgin Mobile is still the best solution for my MiFi needs (which end up being maybe 3 to 5 times per year) but I don’t know what the other (cheaper?) options might be… I did find TruConnect, which might be an option, but I’m open to suggestions. For the most part, the MiFi has worked well as a 3G modem. Connection is hit & miss. Sometimes it’s good, sometimes it’s crap, but it mostly works. I ended up taking it on a recent trip which involved minimal airport waiting time and things went bad. I fully charged it up the night before using the AC charger, and all appeared well. So in the morning at the airport I turned it on, got a few minutes of use, and it died. I wasn’t too concerned since I was just wasting time at the airport. When we got to our destination I plugged it into the AC charger and charged it up, except it didn’t charge up. The charger got warm, so I assumed it was working and decided the battery had died. Ugh. Annoying. Still, not a big deal, as I got free WiFi from our host. So when I got back from my trip I ordered a replacement battery from Amazon, which was less than $5.00. When it arrived I determined that it was not the damn battery, but the damn charger! I confirmed this by charging it up using a USB cable. Also, the charger doesn’t get warm anymore, so I assume it’s dead. Disclaimer: I use a Mac… I’ve not done this under Linux or Windows. Plugin the MiFi, and you will see it mounted in the Finder. Now, for many USB devices if you just want to charge them, you unmount (eject) them, and they keep charging. 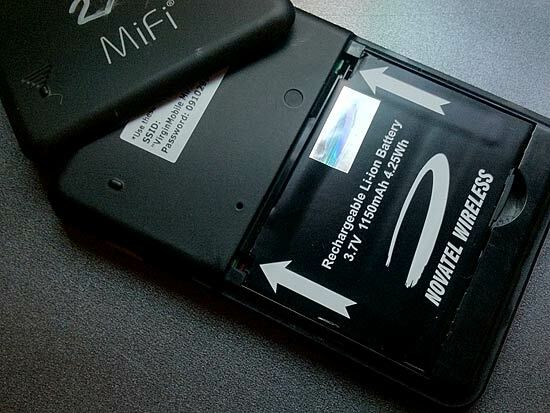 Here’s the trick with the MiFi… Eject it! 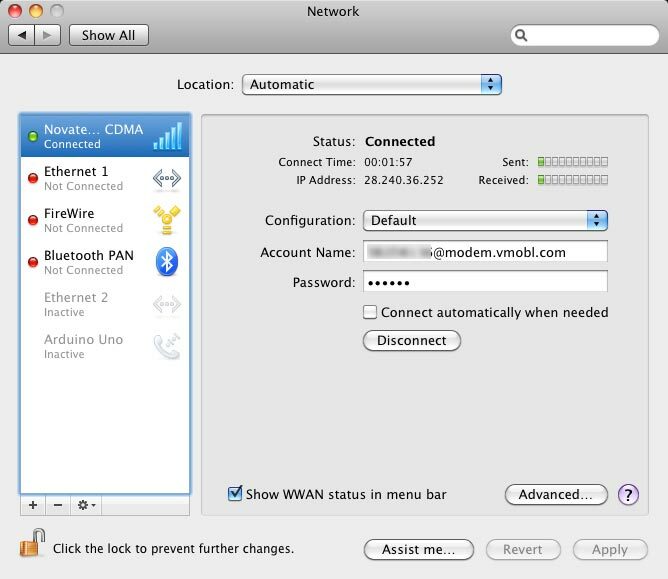 Once you do, it’ll show up as a new network connection and you can see it in the Network Control Panel, and you can click the “Connect” button. Update: I’ve got an addition to what is posted above. 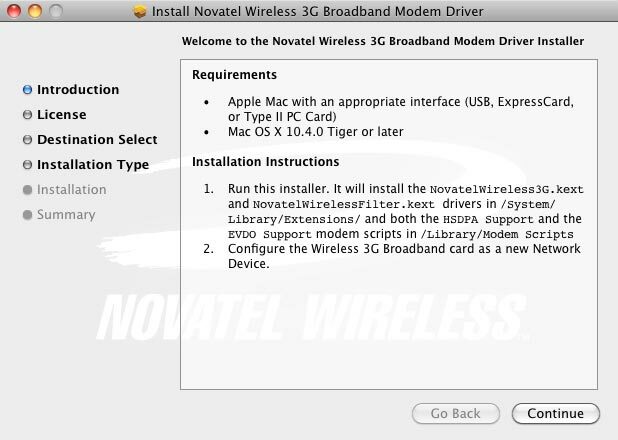 I tried the above on another Mac Pro I have and it did not see the MiFi until I ran the installer you see when you first mount it. 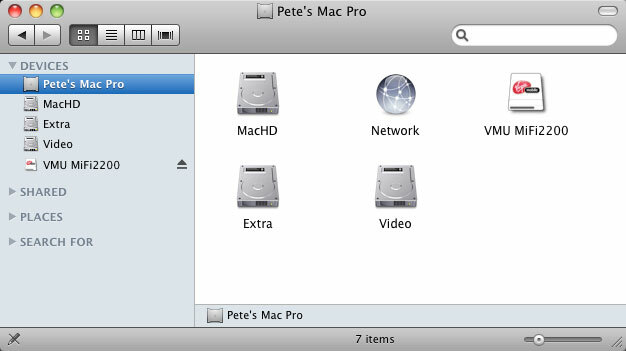 After that, it showed up fine in the Network Control Panel, but the magic values were not filled in. (I also did not reboot, like the installer asked me to.) I ended up getting the Account Name from connecting to the MiFi (using WiFi) and finding it under the WWAN -> Diagnostics menu (listed as NAI) and the password was my 6 digit account pin. A bit more hassle, but now you know where to look. 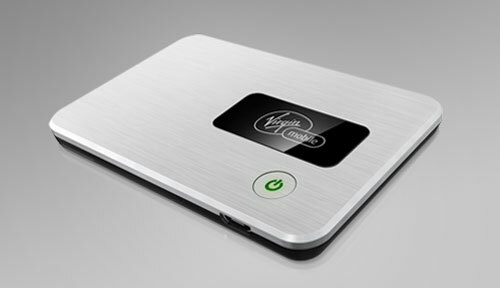 About 6 month ago I picked up a Virgin Mobile MiFi 2200 Intelligent Mobile Hotspot. I just call it a MiFi, as do most people. It’s basically a 3G modem which lets you connect up to 5 devices (via wifi) and get them online. The decision to get the MiFi was driven by the service of Time Warner Cable… after a two-day outage that is. The work I do requires an Internet connection, and I thought the MiFi would be a good backup for Time Warner failures, as well as the occasional traveling I do. Now, there’s plenty of reviews of this model, in fact, here’s one, and here’s another. You can also find review on Amazon and elsewhere, but hey, this is my personal experience, rather than a straight-up review. Anyway, since I’m an AT&T iPhone customer with only occasional needs for tethering, this is still a better (cheaper!) option for me at this point in time. When I first tried using the MiFi at my house, it seemed to work fine. I was satisfied that it would be a good backup solution to another Time Warner outage. My next use was at the Milwaukee Makerspace where I used it as backup for the sometimes unreliable wifi there. It seemed to work OK, though a little slow. I wasn’t sure if it was the building, or the location, or what. I was less than impressed this time. Next was a grade school near West Allis, and the results were similar to at the Makerspace, a bit slow, but better than nothing. I’d also seen then device get really hot a few times. I’m not sure what causes this, as sometimes it happens, but it’s not consistent. I should note that on all of these occasions, it was my MacBook that was connected to it. The thing is, I’ve seen crappy 3G connections on my AT&T iPhone around Milwaukee as well, so I don’t know if it’s saturation of the network, or the buildings, or what. We stayed in Minneapolis at a hotel that did not have free wifi. (Yes, sadly, they still exist.) The MiFi was a champ here, providing us with our own Internet connection. Again, we just used the iPad and I didn’t notice any connection problems. Now, on to the east coast… where I wish I could say the experience was just as good. I didn’t need to use the MiFi until I got to Preston, Maryland, and the house we stayed at had no Internet connection. Being able to connect was totally hit-and-miss. Sometimes it worked, and sometimes it didn’t. 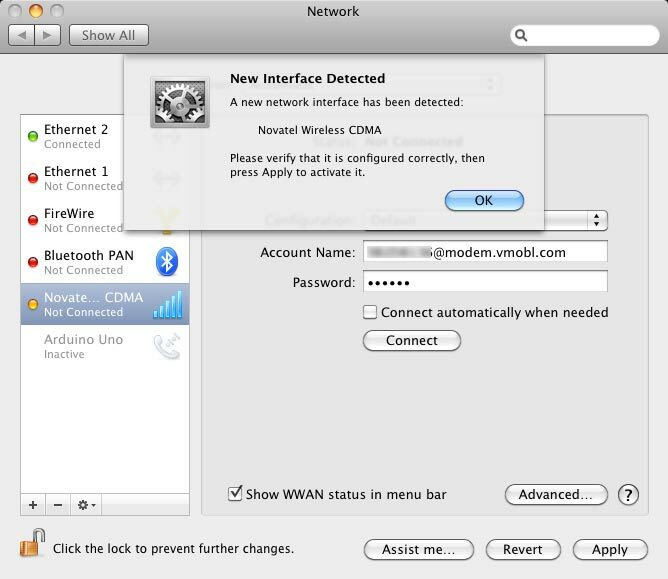 Placing the MiFi up against a window seemed to help. I formulated in my head getting a rubber suction cup so sticking it onto a window were possible. On the last day we were there, the MiFi would not connect at all. It was raining pretty badly, so I wasn’t sure if that was the cause, but then realized that it kept showing the device as “Not Activated” and for some reason, I had to go through the whole activation process again. Luckily Mobile Safari (yes, still using the iPad) managed to maintain the needed activation codes so I didn’t need to type in anything. Still, this “reactivation” was a pain to deal with, and I hope I don’t need to do it again. After the reactivation, all was well again. I even ended up using it on the plane at BWI while we sat on the runway for 30 minutes. In the end, when the MiFi works, it works well, though occasionally a bit slow. The ability to connect seems to depend on a number of factors, and I just need to live with the fact that there is no guarantee it will work at all. I suppose that’s better than nothing… right? 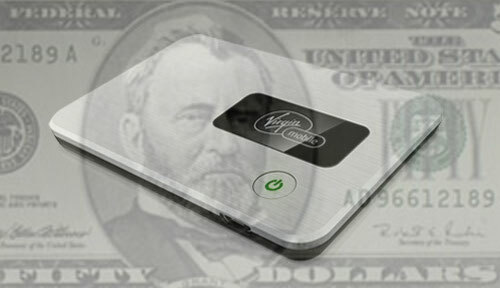 I’d love to hear others’ experiences using this MiFi device, or any others.